Recently I was reading David Schwartz’s book, “The Magic of Thinking Big”. Even though this isn’t about jazz guitar or music at all, it mentioned something that really struck a chord with me. This is a terrible malady that affects countless people worldwide. A lot of people don’t even realize that they have this insidious disease. This horrible illness affects everything you do. It causes you to self-sabotage yourself, and to continually fall short of your goals and dreams. Are YOU thinking like this at the moment when it comes to your jazz guitar playing? If so, you need to stop. Right now. Remember – the way we think shapes our reality. If you continually think “I don’t have any time for such and such…”, guess what happens? Hey presto…it seems as though you won’t have any time! If you structure your practice carefully, follow a clear set of step-by-step instructions, and you have well-defined goals to work towards, you can make great progress with your jazz guitar playing – even if you have limited time. 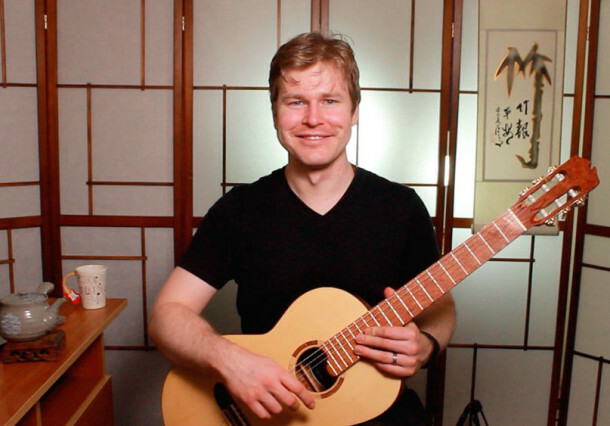 My new program, The FretDojo Academy Club, gives you all of these things – a clear, concise set of lessons on a new jazz standard each month, along with a community of like-minded jazz guitarists from all around the world. Think of the time you’ll save by not having to gather all the “puzzle pieces” together for each new tune you learn. It’s all done for you, step-by-step in the new Club.